2019 SPRING TOUR REGISTRATION IS NOW OPEN! Girls and boys ages 5-14 with parent caddies. From first tournament to qualifying to play in the state, regional, and world championships. 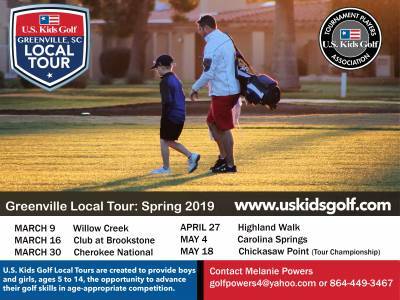 Go to: http://www.uskidsgolf.com/tournaments/local/find-local-tour/284877/greenville to sign up!